Rafid Ahmed Alwan al-Janabi (Arabic: رافد أحمد علوان الجنابي‎, Rāfid Aḥmad Alwān; born 1968), known by the Defense Intelligence Agency cryptonym "Curveball", is a German citizen who defected from Iraq in 1999, claiming that he had worked as a chemical engineer at a plant that manufactured mobile biological weapon laboratories as part of an Iraqi weapons of mass destruction program. Alwan's allegations were subsequently shown to be false by the Iraq Survey Group's final report published in 2004. Despite warnings from the German Federal Intelligence Service and the British Secret Intelligence Service questioning the authenticity of the claims, the US and British governments utilized them to build a rationale for military action in the lead up to the 2003 invasion of Iraq, including in the 2003 State of the Union address, where President Bush said "we know that Iraq, in the late 1990s, had several mobile biological weapons labs", and Colin Powell's presentation to the UN Security Council, which contained a computer generated image of a mobile biological weapons laboratory. They were suggested to be mobile production trucks for artillery balloons. On 24 September 2002, the British government published its dossier on the former Iraqi leader's WMD with a personal foreword by Blair, who assured readers Saddam Hussein had continued to produce WMD "beyond doubt". On November 4, 2007, 60 Minutes revealed Curveball's real identity. Former CIA official Tyler Drumheller summed up Curveball as "a guy trying to get his green card essentially, in Germany, and playing the system for what it was worth." He lives in Germany, where he has been granted asylum. In a February 2011 interview with The Guardian he "admitted for the first time that he lied about his story, then watched in shock as it was used to justify the war." 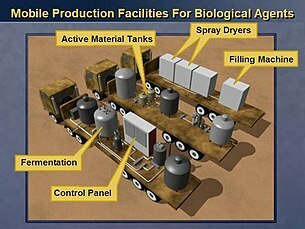 Computer-generated image of alleged mobile biological weapons laboratory, presented by Colin Powell at the UN Security Council. Rafid Ahmed Alwan studied chemical engineering in university but received low marks. He also worked at the Babel television production company in Baghdad, which was owned by Saddam Hussein's son Uday; sometime after leaving his job, a warrant was issued for his arrest because of theft from the same company. Curveball's story began in November 1999 when Alwan, then in his early 30s, arrived at Munich's Franz Josef Strauss Airport with a tourist visa. Upon entering the country he applied for political asylum because he had embezzled Iraqi government money and faced prison or worse if sent home. The German refugee system sent him to Zirndorf, a refugee center near Nuremberg. After he arrived at the refugee center he changed his story. Alwan's new story included that after he had graduated at the top of his chemical engineering class at Baghdad University in 1994, he worked for "Dr. Germ," British-trained microbiologist Rihab Rashid Taha to lead a team that built mobile labs to produce lethal biological WMD. The Germans listened to his claims and debriefed him starting in December 1999, continuing to September 2001. Although the Americans did not have "direct access" to Curveball, information collected by the BND debriefing team was later passed on in part to the Defense Intelligence Agency in the United States. As an incentive to keep supplying information to German intelligence, Curveball had been granted asylum, as he had applied earlier in 1999 and failed. He had enough money that he did not have to work. He gave many hours of testimony about Iraq's WMD program and in particular its mobile weapons laboratories. Despite CIA technicians and weapon experts finding major flaws and inconsistencies with the designs and systems he asserted the military was developing, this information made it to the American government and although there were wide doubts and questions about the claimed informant's reliability and background, assertions attributed to Curveball claiming that Iraq was creating biological agents in mobile weapons laboratories to elude inspectors appeared in more than 112 United States government reports between January 2000 and September 2001. His assertions eventually made it into United States Secretary of State Colin Powell's address on February 5, 2003 to the United Nations detailing Iraq's weapons programs. 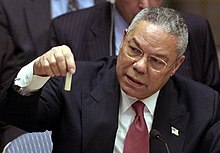 February 5, 2003 - United States Secretary of State Colin Powell holding a model vial of anthrax while giving the presentation to the United Nations Security Council. According to a Danish state TV documentary, DR1 Dokumentaren "Manden som løj verden i krig" broadcast on April 21, 2010, Curveball was still living in Germany under protection from the German police. Danish TV filmed Rafid and recorded clips of conversation with him, before he called the police and had the TV-crew banned from his neighbourhood. In 2003, inspectors led by David Kay conducted additional investigation of Curveball's credibility. They found among other things that he had been placed last in his university class when he had claimed to have been placed first, and that he had been jailed for embezzlement before fleeing to Germany. Curveball's German intelligence handlers saw him as "crazy … out of control", his friends called him a "congenital liar", and a US physician working for the Defense Department who travelled to Germany to take blood samples seeking to discover if Anthrax spores were present was stunned to find the defector had shown up for medical tests with a "blistering hangover", and he "might be an alcoholic". While there were many reports that Curveball was actually a relative (younger brother) of one of Ahmed Chalabi's Iraqi National Congress (INC) top aides, the investigative commission stated that it was "unable to uncover any evidence that the INC or any other organization was directing Curveball." The Bush administration ignored evidence from the UN weapons inspectors that Curveball's claims were false. Curveball had identified a particular Iraqi facility as a docking station for mobile labs. Satellite photography had showed a wall made such access impossible, but it was theorised that this wall was temporary. "When United Nations Monitoring Verification and Inspection Commission (UNMOVIC) inspectors visited the site on February 9, 2003, they found that the wall was a permanent structure and could find nothing to corroborate Curveball's statements." Instead, the inspectors found the warehouse to be used for seed processing. The Bush administration laid blame on the CIA, criticizing its officials for "failing to investigate" doubts about Curveball, which emerged after an October 2002 National Intelligence Estimate. In May 2004, over a year after the invasion of Iraq, the CIA concluded formally that Curveball's information was fabricated. Furthermore, on June 26, 2006, The Washington Post reported that "the CIA acknowledged that Curveball was a con artist who drove a taxi in Iraq and spun his engineering knowledge into a fantastic but plausible tale about secret bioweapons factories on wheels." On April 8, 2005, CIA Director Porter Goss ordered an internal review of the CIA in order to determine why doubts about Curveball's reliability were not forwarded to policy makers. Former CIA Director George Tenet and his former deputy, John E. McLaughlin, announced that they were not aware of doubts about Curveball's veracity before the war. However, Tyler Drumheller, the former chief of the CIA's European division, told the Los Angeles Times that "everyone in the chain of command knew exactly what was happening." In February 2011, Rafid Ahmed Alwan al-Janabi admitted for the first time that he lied about his story regarding Iraq's secret biological weapons program. He also admitted to being shocked that his false story was used as a justification for the Iraq War but proud that the fabrications helped topple Saddam Hussein. According to the Danish film The Man Who Lied the World Into War (2010/2011 update, basing on sources) after he was found by the document makers and they put questions to the chief security and spy services of his new home country, he lost his "work" (in a company found and described by the document makers as a cover with his position of "marketing specialist") and "salary with flat". Then, when he had to get back to the social one-room flat with social security help-salary, he phoned the documentary staff proposing an interview for the €40,000 (before the UK newspaper article). He also showed papers which, according to him, clearly proved that a contract between him and this "cover company" had been signed for the 15 years, starting in the 1999/2000, with a relatively high monthly salary of €3,000. Allegedly because the Iraqi informant disliked Americans, Germany's intelligence service (BND) classified him as a "blue" source, meaning the Germans would not permit U.S. access to him (red sources were allowed American contact). Later evidence indicated that he was in fact pro-American, and that the Germans were guarding their source. The Germans did pass on information to the American intelligence agencies and the informant was given the codename "Curveball". Despite it being an American term, the Americans deny coining the name, and its origin is uncertain. The base cryptonym "ball" had been used during the Cold War when dealing with informants who had intelligence about weapons. ^ a b c "Iraq war source's name revealed". BBC News. 2007-11-02. ^ "The Record on CURVEBALL: Declassified Documents and Key Participants Show the Importance of Phony Intelligence in the Origins of the Iraq War". National Security Archive, The George Washington University. 2007-11-07. Retrieved 2008-04-17. ^ Drogin, Bob (Spring 2008). "Determining the Reliability of a Key CIA Source". Nieman Foundation for Journalism at Harvard University. Archived from the original on 2008-04-21. Retrieved 2008-04-16. ^ Drogin, Bob; Miller, Greg. "WMDs were mostly defector tales". Deseret News. Retrieved 4 March 2019. ^ "Iraq: The spies who fooled the world". BBC News. 2013-03-18. ^ a b "Faulty Intel Source 'Curve Ball' Revealed". 60 Minutes. CBS News. 2007-11-01. ^ a b c Drogin, Bob; Goetz, John (2005-11-20). "How U.S. Fell Under the Spell of 'Curveball'". Los Angeles Times. Archived from the original on 2007-08-02. Retrieved 2007-07-23. ^ a b "Complete timeline of the 2003 invasion of iraq". cooperativeresearch.org. 2005-11-20. Archived from the original on 2007-09-30. Retrieved 2007-07-23. He speaks to his BND debriefers in Arabic through a translator, and also in broken English and German. Curveball says that he worked for Iraq's Military Industrial Commission after graduating first in his class from engineering school at Baghdad University in 1994 (He actually graduated last (see 1994)). A year later, he says, he was assigned to work for "Dr. Germ", British-trained microbiologist Rihab Rashid Taha, to construct mobile biological weapons labs. But Curveball never says that he actually produced biological weapons or witnessed anyone else doing so and the BND is unable to verify his claims. Curveball's statements are recorded in German, shared with a local Defense Intelligence Agency (DIA) team, and sent to the US, where they are translated into English for analysis at the DIA's directorate for human intelligence in Clarendon, Va. "This was not substantial evidence," one senior German intelligence official later recalls in an interview with the Los Angeles Times. "We made clear we could not verify the things he said." The reports are then sent to the CIA's Weapons Intelligence, Non-Proliferation and Arms Control Center (WINPAC), whose experts analyze the data and share it with artists who use Curveball's accounts to render sketches. ^ Drogin, Bob, Curveball, Random House, 2007, p.12: "it was nearly Christmas 1999"
^ Drogin, Bob, Curveball, Random House, 2007, p.31: "senior BND officials decided to bar the CIA from talking to their new source", p.36: "Curveball hates Americans, they told the visiting DIA team. He absolutely refuses to meet any Americans. … Sorry, they said, he's completely off limits." ^ Chulov, Martin and Pidd, Helen Defector admits to WMD lies that triggered Iraq war, The Guardian: "After [Powell's speech at the UN], Janabi said he called his handler at the BND and accused the secret service of breaking an agreement that they would not share anything he had told them with another country"
^ Drogin, Bob, Curveball, Random House, 2007. ^ a b Warrick, Joby (2006-06-25). "Warnings on WMD 'Fabricator' Were Ignored, Ex-CIA Aide Says". The Washington Post. Retrieved 2007-07-23. ^ Pike, John (2006-12-04). "Mobile Biological Weapons Facilities – Winnebagos of Death". globalsecurity.org. Retrieved 2007-07-24. From January 2000 to September 2001, the Defense Intelligence Agency's (DIA) Human Intelligence disseminated almost 112 reports from Curveball regarding mobile BW facilities in Iraq. These reports did not come directly from Curveball, but were transferred through a "foreign liaison." ^ "Manden som løj verden i krig(The man who lied the world into war)". Danish State Radio. 2010-04-21. Archived from the original on 2010-04-23. ^ Bob Drogin, Curveball (Ebury Press, 2007), p. 70. ^ Helmore, Edward (2005-04-03). "US relied on 'drunken liar' to justify war". The Observer. London. Retrieved 2007-07-24. ^ a b Vest, Jason (2005-04-07). "Big Lies, Blind Spies, and Vanity Fair". The Village Voice. Archived from the original on 2007-11-06. Retrieved 2007-07-24. Footnote 274 [of the Iraq Intelligence Commission] elaborates, explaining that "when [DIA] pressed for access to Curveball, [BND] said that Curveball disliked Americans and that he would refuse to speak to them." ^ Harding, Luke (2004-04-02). "Germans accuse US over Iraq weapons claim". The Guardian. London. Retrieved 2007-07-24. It has now emerged that Curveball is the brother of a top aide of Ahmad Chalabi, the pro-western Iraqi former exile with links to the Pentagon. ^ Miller, Greg; Drogin, Bob (2005-04-01). "Intelligence Analysts Whiffed on a 'Curveball'". Los Angeles Times. Archived from the original on 2007-08-03. Retrieved 2007-07-24. ^ Linzer, Dafna (2005-04-03). "Panel: U.S. Ignored Work of U.N. Arms Inspectors". The Washington Post. Retrieved 2007-07-24. ^ Drogin, Bob, Curveball, Random House, 2007, pp 170-177. ^ Drogin, Bob; Miller, Greg (2 April 2005). "'Curveball' Debacle Reignites CIA Feud" – via LA Times. Drogin, Bob (2007). Curveball: Spies, Lies, and the Con Man Who Caused a War. Random House. ISBN 1-4000-6583-6. "Curveball collected news and commentary". The Guardian. This page was last edited on 20 April 2019, at 23:05 (UTC).